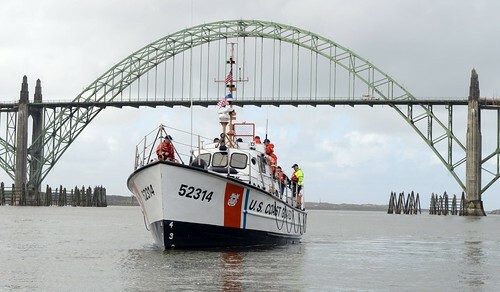 For any child, spending a day with the Coast Guard would be something special. The unique experience of being able to have one-on-one time a unit is something quite out of the ordinary exciting. 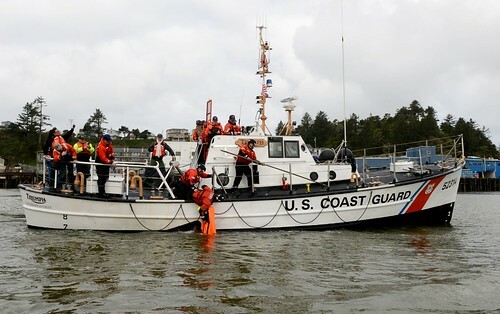 This was evident through the excitement that showned brightly in the smiles of eight-year-old Richie Wood when he had the opportunity be a Coastie for a Day with Port Security Unit (PSU) 311 in August. Richie is no ordinary child. This hip-hop dancing, straight-A student, rock wall climber, was diagnosed with Goldenhar Syndrome at a very early age. Goldenhar Syndrome is a congenital birth defect, which has no genetic or hereditary cause, no cure and something Richie has had to live with for his entire life. At 7:30 a.m. sharp, the crew stood in formation waiting instruction from the commanding officer. Richie, standing next to PSC Ernest Gomez, already looked like a unit member, wearing the same desert uniform, even though it was little oversized, folded over at the waist and the sleeves were rolled to his elbows. A little intimidated at first, though also visibly excited, Richie marched to the commander’s side, closely following the chief. Once the new seaman was in position, the crew was officially introduced to their new member, and directed by Stefanisin to get him qualified in as many things as possible. The day proved to be full of adventure for Richie with lots of activities. He started his day off with a tour of the unit’s boathouse and the Maritime Safety and Security Team’s boathouse next door. 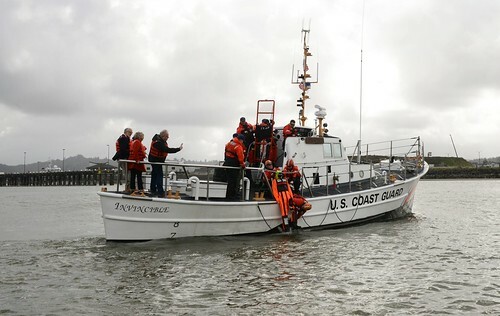 While he there, Gomez lifted him into the different boats and explained the equipment each boat had. Once they were finished in the boathouse, Richie had the opportunity to go for a quick boat ride with the Los Angeles County Lifeguards. 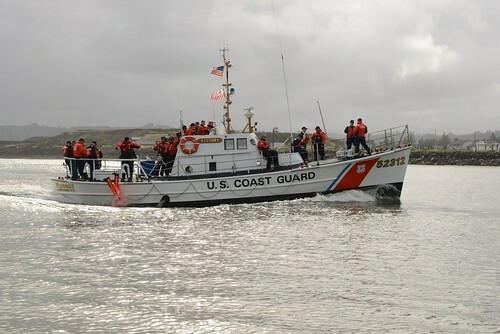 During his ride they met up with a boat crew from the MSST. 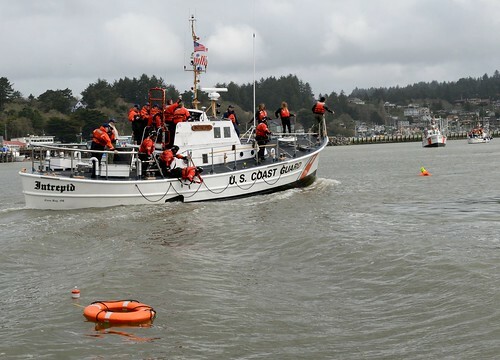 The coxswain of the MSST boat and the lifeguards teamed together and allowed Richie to douse one of the MSST boat members with the water hose on the lifeguard boat. Richie’s smile was infectious, even to the drenched Coastie. After his ride with the lifeguards the excitement really kicked in. 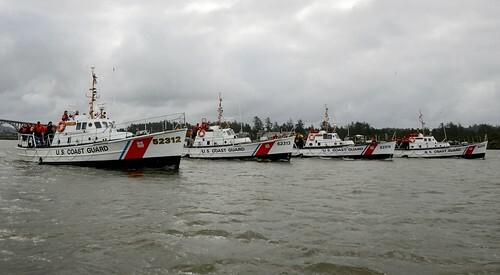 The members of PSU 311 had two boats waiting for him at the Coast Guard dock to take him on a longer boat ride out to sea. On the way out Richie and the crew saw a couple of sea lions basking in the sun on top of the buoys. A little further out they discovered they were in a pod of dolphins that were playing around the boat. Then, about five miles out, it all changed. In a simulated experience for Richie, the boat’s “secret gray phone” rang. The person on the other end told the coxswain that pirates were spotted offshore and Richie had to take out the engines! PS2 John Clark helped his new shipmate load the machine gun (with blanks) so he could fire at the simulated pirates. 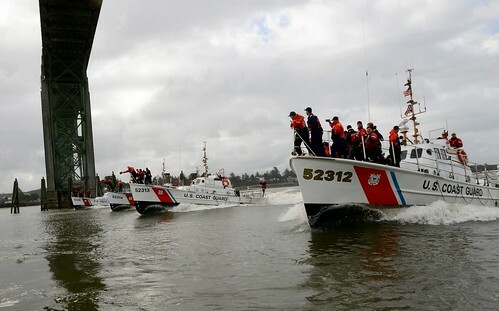 The pure joy of being able to do something to help keep Los Angeles safe from pretend pirates brought lots of cheering and laughter from the young Coastie for a Day. Richie’s day concluded with the Chief’s Mess inducting him as an honorary Chief, which left him just about speechless. “This is very special, Richie. They don’t even let me in!” Stefanisin told him, which brought laughter from the boy and everyone around. “This was an incredibly special day for Richie,” his mother Tracy said. It was also special to the crew. “I always enjoy in participating in events where we get to educate kids and show them what we do,” Clark said. “This young little warrior walked tall and proud with an unbelievable confidence. I don’t believe anyone ever bothered to explain fear and failure to him. Then again, that is a luxury I believe he simply can’t afford. What was the best part of the day for Richie? He said he enjoyed everything; driving the boats, seeing the sea lions, playing with the dolphins and keeping Los Angeles safe, it was a true adventure for him. The smile that spread across his face, and the stories he was already telling his parents, said it all. SAN PERO, Calif. – PSC Ernest Gomez and Seaman for a day Richie Wood salute colors Aug 16. Richie visited the Port Security Unit 311 and was able to participate in a couple of boat rides, shoot the machine gun and capped his day off by being made an honorary chief by the PSU’s Chief’s Mess.